Just opened! A multi-pack, play-by-post, literate forum roleplay, Wolf Valley! The Heavenheld live on the highest mountain in the northwestern mountain chain, Clarity Peak. The Helds are excellent climbers, they have developed the ability to sustain the harshest of temperatures. They only come down to feed or speak with the other packs. Their fur is much thicker than the other wolves and their body temperature rests at 114 degrees Fahrenheit. This pack is passive, usually refusing to fight. They are very obedient to their alpha. The Deepwood live in the southeastern region of Wolf Valley, Sacred Grove. These wolves prefer night to day, as the heart of Sacred Grove remains illuminated by the glow of various plants. They look to the Deepwood Shrine* for advice and leadership. Since wolves are the only known animal to live in Sacred Grove, they turn to the banks of Gray Lake for food. This pack is aggressive towards The Gray, but allied with Frostwind and The Helds. This pack follows direction of Deepwood Shrine as given by the pack's alpha. *Deepwood Shrine: Deepwood Shrine is a stone structure of unknown origin. It's cloaked in moss and vines. It resembles the head of a dire wolf. Its mouth is open, leading to an alter. The eyes are made of a yellow-glowing stone. 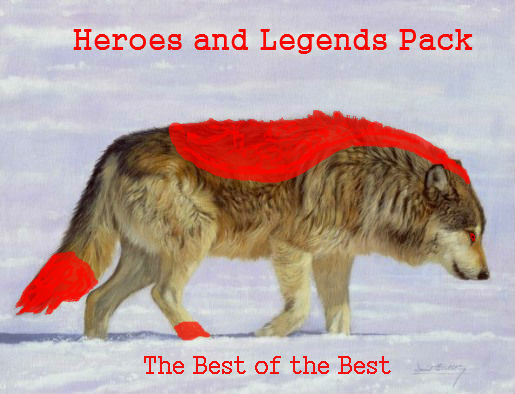 Only keepers and pack alphas are granted access to enter. The Frostwind dwell in the southwestern region of Wolf Valley, Frozen Forest. They are magnificent hunters, having plenty of practice with tough game. Their teeth are much sharper and longer for grabbing fast prey with great force. Their stomachs are made to conserve food, letting them survive for long periods without eating. They refuse to ingest anything that is not from their territory, they depend on Frozen Forest, and the Forest alone. Frosters are an aggressive pack. They despise the Helds for their friendly nature. Fighting is a big part in this pack's culture. From the early age of two months, these wolves are raised to be fierce warriors. They obey orders from the alpha without fail, and protect pack members with their life. They ally the Shriners, and are neutral to The Grays. And lastly, The Gray. Not much is known about The Gray. They reside in the northeastern region of Wolf Valley, Sky Hills. They were the first of the four. They are the owners of Gray Lake, and the island in its center, Gray Isle. They tend to keep to themselves. Detailed plot to be posted soon!